The Dude Train in 1895. Before private jets, or even private automobiles, the wealthiest visitors to the Cape and the Vineyard had their own private train. The “Dude Train,” the “Flying Dude,” the “Dude Flyer.” It’s one of the most famous passenger trains ever to run in New England, but you couldn’t walk up and buy a ticket to board it. Nor did any of its various nicknames ever appear in an official timetable or on a station wall. Yet for thirty-three summers, from 1884 to 1916, it plied the tracks from Boston to Woods Hole, a distance of seventy-two miles, whisking wealthy Bostonians at unprecedented speeds and with unsurpassed luxury from their city offices to their summer retreats on Cape Cod and the Islands. It was a sort of NetJets for the Gilded Age, a unique, subscription-only private train. And though it last ran a century ago, and the tracks down to the ferry landing have long since been converted into a bike path, for train aficionados, the Dude abides. 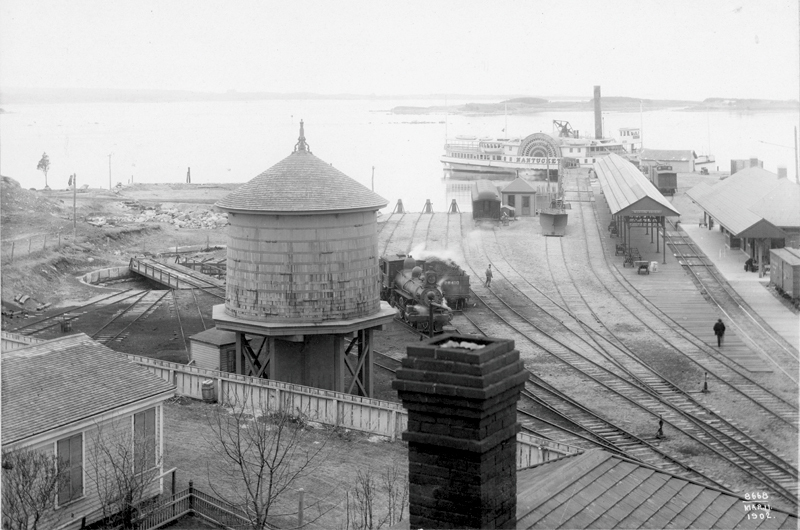 Woods Hole terminal in 1902. What they wanted, the club’s executive committee explained to the railroad, was a seasonal, private, posh, weekday train that would allow them relatively full days in their Boston offices with plenty of time for a leisurely business lunch, yet get them to their summer homes in ample time for cocktails with their families. In exchange, they would guarantee the railroad a minimum income for the season: by 1914, for example, the figure was $22,185 for a season lasting from June 5 to October 5. The train made its first run on June 23, 1884. Its original make-up – railroaders would call it the “consist” – was a combination baggage-smoking car and two drawing-room cars, named Naushon (the Forbes’ island) and Mayflower. Additional drawing-room cars that came later were Cottage City (as Oak Bluffs was known at the time) and King Philip (presumably after the Wampanoag resistance leader of 1675, whose real name was Metacomet). These cars, of wooden construction, were elegant: highly polished wood interiors tricked out in brass, with plush seats. Perhaps surprisingly, the original locomotive, No. 100, or “Foxboro” – locomotives were often named in that era – was something of a veteran, having been built by the Rhode Island Locomotive works in 1870 for the Boston, Clinton & Fitchburg Railroad. (That line was later absorbed by the Old Colony Railroad, which in turn was absorbed by the New York, New Haven, & Hartford Railroad.) It had a tall smokestack, oil headlight, and stubby tender coupled behind, adequate to carry the coal and water needed for the Dude’s short run. On its original schedule, which changed little over the years, the Dude left Woods Hole at 7:40 a.m. and arrived at Boston’s Kneeland Street Station at 9:25 a.m. (When Boston’s South Station opened in 1899, that became the Dude’s terminal.) The train departed Boston at 3:10 p.m. for a 4:50 p.m. arrival at Woods Hole. In 1892 a second Dude was born, to serve Marion, Mattapoisett, and Fairhaven on the Fairhaven Branch, and after 1896 the two Dudes ran as one train north of Tremont, then split into trains for Fairhaven and Woods Hole. 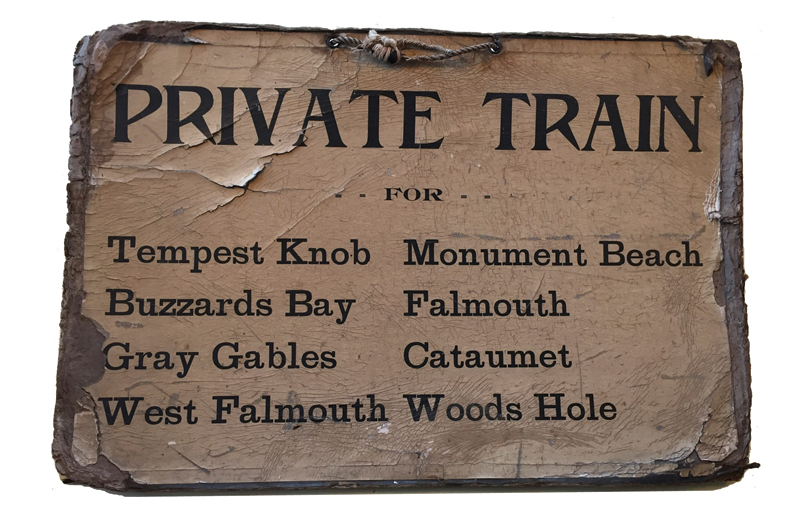 According to the “Private Train” sign that hung in Kneeland Street Station, the Dude served Tempest Knob in Wareham, Buzzards Bay, Gray Gables, West Falmouth, Monument Beach, Falmouth, and Cataumet en route to Woods Hole. Perhaps most interesting of all stops was the dollhouse-like depot at Gray Gables, built for President Cleveland during the time between his two terms. Gray Gables, on Monument Neck in Bourne, was the Summer White House during his second term, from 1893 to 1896. The little depot the president used is now preserved at the nearby Aptucxet Trading Post Museum, operated by the Bourne Historical Society. What club members got for their money in addition to exclusivity and deluxe accommodations was speed. At roughly an hour and forty-five minutes each way, the Dude saved over an hour compared to the regular trains between Boston and Woods Hole. This was accomplished by running express as far as Tempest Knob and after that stopping only “on demand,” where a member or guest wished to board or disembark. Though average speed over the entire run was 43 miles per hour, between Brockton and Middleboro the Dude would touch 60 miles per hour – “flying,” indeed, for that early era of railroading. The Dude Train, shown here at Cataumet station, only stopped if there were members of the club who wanted to board or disembark. Exactly who started calling it the Dude Train is not known for certain. Employees’ timetables listed the train only as “Limited Express Passenger” and public timetables never mentioned it at all. The nickname is thought to be a coinage of Harry Meyers, its first conductor, who likely picked it up from the passengers. At that time “dude” did not mean an urbanite at a recreational Western ranch, a wannabe surfer, or a middle-aged bowler in a cardigan. Nor was it a general term of address. It meant a dandy, a fashionable man perhaps excessively concerned with clothes and manners. 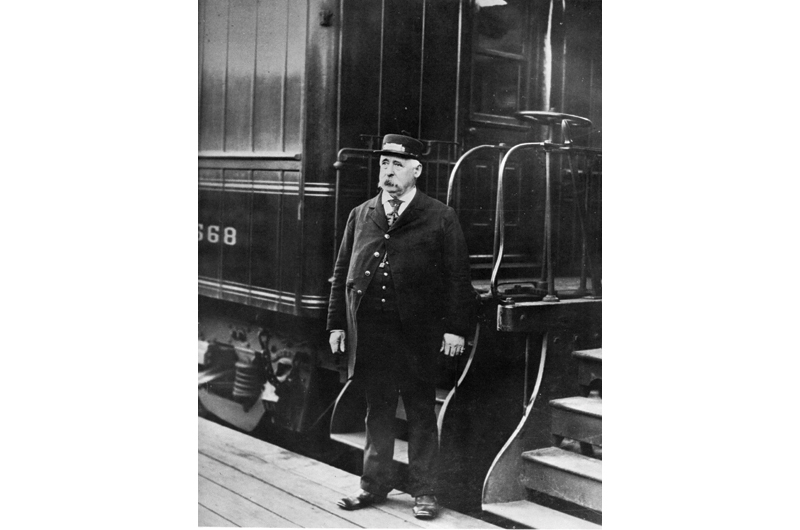 Meyers may have named the train, but Augustus S. Messer, who took over as conductor in 1889, is the man most closely identified with it. A lifelong railroad man and a conductor on the Woods Hole Branch for thirty-two years – fourteen of them on the Dude – he was an imposing man, with a walrus mustache and a prodigious girth that allowed only the top brass button of his dark-blue uniform jacket to be closed. It was universal railroad practice that the conductor, not the engineer, as one might expect, was in charge of the train, and Messer looked more than able to fill that role. He personified the train to his regular riders, with whom he mixed comfortably in spite of their exalted and moneyed status. He even took President Cleveland, on his way to Gray Gables, in stride. Augustus S. Messer was the beloved conductor of the private train for many years. 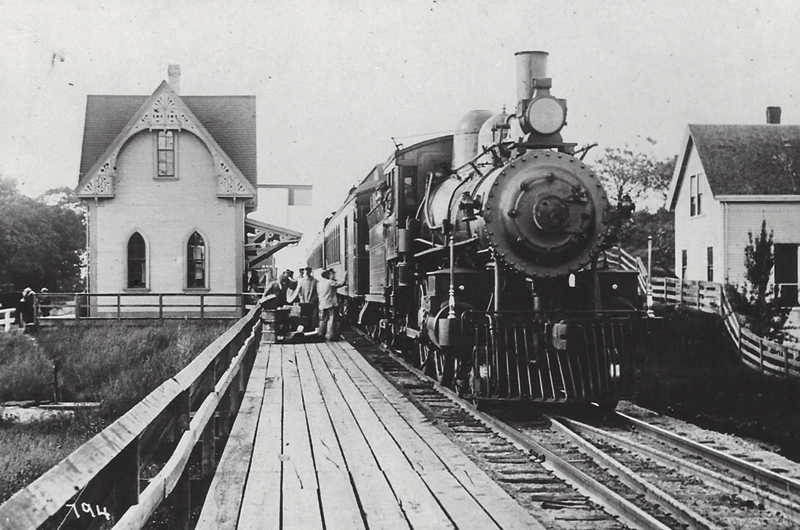 On July 18, 1872, twelve years before the first Dude Train, the eighteen-mile Woods Hole Branch opened to the public and delivered passengers to the waiting sidewheel paddle steamer Island Home. Financed in part by bonds to which such prominent Vineyarders as Dr. Daniel Fisher and the management of the Oak Bluffs Land & Wharf Company subscribed, construction had begun at Cohasset Narrows, now called Buzzards Bay, and immediately crossed the Monument River on a 320-foot-long trestle. The river was later converted into the Cape Cod Canal, which was completed in 1916, and the rails now cross the magnificent 1935 vertical lift bridge, visible from the Bourne Bridge. As investors had hoped, completion of the line caused land values along Buzzards Bay and on the Islands to boom. But New Haven finally had its way and passenger service on the Woods Hole Branch ended in 1964. The rails of the three-and-a-half-mile Falmouth–Woods Hole stretch were lifted in 1969, and that right of way is today the Shining Sea Bikeway. In the last years, the Woods Hole trains were self-propelled rail diesel cars, called RDCs, or “Budd Cars,” since they were built by the Budd Company. These utilitarian coaches were about as far from the Dude Train as a rider could get – but at least they were open to anyone who had the fare.